Cathy had followed a pin on Pinterest that featured her photo…but ended up on someone else’s blog. I took a look at the blog she pointed to and – sure enough – it was a photo from Cathy’s web store. I had just finished working on the site and still had the high-res version of the photo in question on my desktop. The Photo Thief had obviously googled her subject and just decided to take the first photo that appeared, for use on her own blog. There was no link to Cathy’s web store, no mention of where the photo came from. It wasn’t this blogger’s property, but she took it. If you’ve ever had a photo from your blog published elsewhere without permission, you know exactly what I’m talking about. Anger isn’t the right word: it’s infuriating to see your work on someone else’s site, when you pour hours of every week into creating original content and original photos for your blog. So what did we do about it? Keep reading. Maybe if it was 2007, people could use the excuse, “Oh, I’m sorry! I didn’t know!” But folks, we all know it’s not just inconsiderate to take other people’s published work; it’s illegal. If you EVER have a question about whether you should use someone else’s work, the best thing to do is ask. Because really, how hard is it? 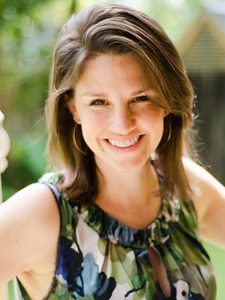 This is Jeni Elliott from Biz Mavens. I’m putting together a post about how to keep visitors (esp. from Pinterest) on your blog when they’ve only come in to see a single article. I’d like to use one of your sidebar images (probably the brainfood one?) as an example of great content showcasing. I think you do an amazing job of giving your readers (even ones who just arrived!) ways of exploring your content and connecting with you, and I’d like to offer your blog as an example. […] Would you allow me to do that, and link straight to your blog in several places? I’d sure appreciate it! And with that kind of a question, what do you think her response was? What a kind thing to ask! Certainly you may use my images. Thank you for thinking of Rockin’ Granola. Do you want to grab it from the page, or do you need me to email you the image? I’m looking forward to reading the article. There. Easy as pie. I was allowed to use her image, she got blog traffic from me, I got blog traffic from her…everyone wins. The blogger was using WordPress.com (not self-hosted WordPress) as her blogging platform. So basically, if you are going to blog for free, you’d BETTER NOT STEAL SOMEONE’S STUFF. And it’s not just WordPress, either. Blogger has a well-known reputation for taking down people’s blogs for a number of reasons, but they’re really serious about Copyright infringement…so much so that if someone is stealing your photos, content, or other copyrighted material, Blogger has a form to report it to them. There were a few back-and-forth comments between the blogger and Cathy at first, but when the blogger demanded that Cathy “show proof” that she had taken the photo, that’s when I stepped in. In the end, the blogger took down the photo…which was the whole point, and I’m glad it worked out. I’m sure that she (and hopefully anyone reading this!) will start taking her own photos before she publishes a post instead of afterward. 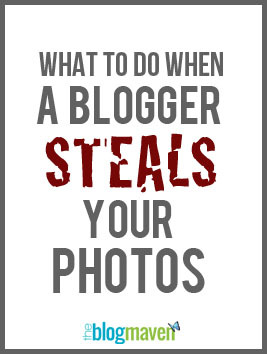 So what should you do if someone steals your photos for their blog? Ask yourself if this is really important to you. Don’t go cracking the whip behind photo thieves “just because Jeni B. said to.” But if you know you’d feel badly for not sticking up for your rights, then don’t waste any time, either. Take action quickly so you don’t have to feel bad for very long. If it looks like a simple error (e.g., they mentioned your name but forgot to provide a link to the blog post they got it from), email them and kindly ask them to fix that. Go the extra mile and send them the URL of the post it should be linked to. If it looks like the blogger has a habit of stealing other people’s work (as was the case here), all bets are off. Leave them comments on the post. Ask (nicely) for them to remove the photo. Just as there isn’t any etiquette about how you should ask a house breaker to give you your jewelry back, there’s no etiquette that governs approaching photo thieves, either. You may even choose to contact your blogging friends to support you. But just remember: anything you do publicly on the internet will stick around and reflect on you. So if at all possible, give them the opportunity to make things right, and keep your cool. What if leaving comments/emailing doesn’t work? We’d like to think that people who steal other bloggers’ photos or content are doing so “accidentally” and give them the benefit of the doubt, but if they’re ignoring your requests to give proper credit for your photo or to remove your photo from their blog, there’s something deeper going on here. If the blogger is using a free service to publish her blog, you’ll be happy to know that both Blogger and WordPress.com have ways of reporting copyright infringement. You can find Blogger’s form here and WordPress.com’s form here. By submitting a report to the company that hosts a free blogger, you’re taking it to the next level, so be prepared to back up your claim to be the creator of the photo in question. Unfortunately, if the blogger is self-hosted, neither WordPress nor Blogger is going to leap to your rescue. And since this is foreign territory to me, I’m going to refer you to an incredibly thorough article (written in 2006, but still completely relevant) that breaks things down step by step. And if they still won’t take down my photo? At a certain point, it’s not worth the energy anymore. You can feel good about the fact that you stuck up for your rights. But in the end, some people are just scumbags. Just know that they’ll be in for lots of trouble in the future. Because if you’ve been through all this and they still claim that your photo is theirs, it’s a habit. They’ll do it again, to someone else. And eventually, it will catch up with them. Watermark your images with your name and/or logo. If you don’t know how to do this, I’ll be teaching it as part of my Photoshop Elements for BLOGGERS workshop next month. I know of some cases where other bloggers have stolen photos and cut off the watermark, but all I can say is, make it as prominent as possible without making your photo look bad. Don’t use any full-sized images on your blog. Only make them as big as you need them to be for that post. At least you’ll know that people can’t use your photo in any larger of a space than where you’ve placed it on your blog. If you’re worried about people taking your photos and selling prints of them, use a program like Photoshop or Photoshop Elements to change the photo quality to 72dpi. This resolution is high enough for the web, but it isn’t high enough to give good quality for printing. Even though your photos are automatically copyright protected by law as soon as you publish them, it’s a good idea to state your copyright policy right on your blog. If you don’t want people to use your photos at all, just say so. If you want them to ask first, just say so. If there are certain conditions where people are free to use your photos, then spell it out. Be as clear as possible so there’s not any question. 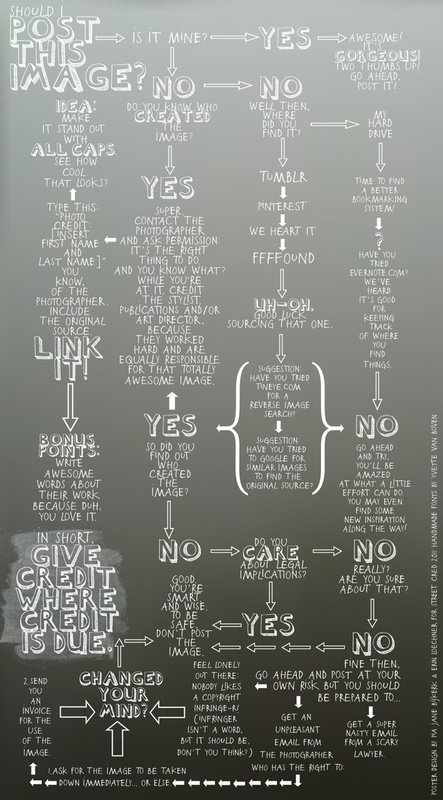 (By the way – if you don’t mind sharing your photos, here’s a handy guide to Creative Commons licensing). [Advanced] Use your photo software to edit the image’s EXIF data. This attaches a copyright notice to the image file itself, which discourages people from stealing it…and gives you proof of ownership if someone asks for it. If you have a camera that’s fancier than mine, your camera itself may allow you to add your name to the EXIF data for all your images automatically. I’m anxious to hear your thoughts on this topic, since people’s opinions are so different. 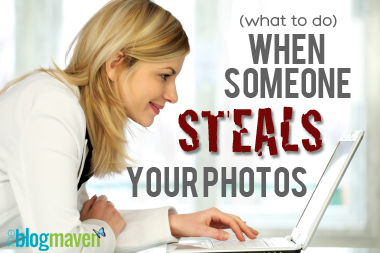 Have you had any experiences with photo theft? Do you think it’s wrong, or just a “given” in the age of Internet publishing? Please share this post, then leave a comment below and let’s discuss. I actually just had a reader email me last night saying that one of my Alphabet Glue photos was on a popular clothing website in their header for a particular post. I quickly sent a super polite email just saying that the site is lovely but that I really needed credit for my photo or for it to be removed. They emailed back right away, apologized, and then updated the site to reflect that the photo was taken by me. *And* they are sending me a little free gift. I think it was a definite honey vs. vinegar situation and I am so glad that I decided to be really nice in tone of my email because it set the whole thing up to be a pleasant interaction instead of a contentious one. Great article. I appreciate all of the information. I had an experience where my blog content was being taken and published by another blogger… I was so pleased to see how quickly Blogger responded when I reported it. It’s really nice to know that Blogger takes care of things so quickly. I know photo/content stealing are things that have been going on for years, but it’s easier to track those people down now – especially with Pinterest and so much other social sharing going on. Glad it worked out for you in the end! Excellent, well explained advice! So often there’s misleading or flat-out incorrect information published on this topic, but this post is perfect. I’ve had to deal with infringers a number of times for my two companies over the years (pretty much the only time I’ve used my J.D.). This is an excellent summary for those who don’t have the benefit of three years of law school! I’ll be sure to bookmark and share it. Thanks for your comment, Nikki. Unfortunately, I think everyone is going to run into this situation sooner or later. Better to prevent it from happening in the first place, but there are always people who’ll go out of their way to steal other people’s intellectual property. I think it’s useful to have a plan *before* it happens so you don’t do something rash because you’re angry. This is becoming quite a problem I think for bloggers and pictures and fresh visuals are becoming more important for grabbing and keeping people’s attention. One helpful website for stock images a colleague of mine recently sent me to was http://www.photopin.com. On their website they detail how to use legally use a free stock photo and how to properly site and give credit to the one who took the image. A really great resource for a word curator/editor like myself! Thanks again Jeni for this great info! Thanks for writing this article. I like your advice. I saw someone started following me on pinterest, so went to follow them back. Their main pinterest picture was a flower photo from my blog. Seeing their name, they were a regular reader of my blog. In that particular case, I decided not to do anything about it, but each circumstance is different. Thanks to this article, I feel I’ll have the tools if I am ever in a situation where I feel I need to act. I love how you help empower people. Thanks! Hi Taryn, thanks for your comment. I agree that every case is different. Unfortunately, there are people out there who are just too lazy to take the photos themselves, so they take the shortcut and use someone else’s. Your blog falls into the unique category of “inspirational,” so I can see where (especially on Pinterest) readers might think it’s okay to use your photos for their own (and other people’s) inspiration. I think the best thing to do is come up with a policy for how other people can use your photos. It will help make some gray areas less gray. 🙂 I appreciate you taking a moment to leave your note. Happy Fall! I don’t have a blog, but do appreciate the time that goes into producing the content. I actually had an experience with a local community newspaper. They asked for a photo I took to use with an article and I clearly stated that I would provide the photos as long as they gave me credit. They published the paper and didn’t credit me. At that point, all they could do to rectify the situation was print a follow-up note in another issue way back in the paper where nobody would really see it. It’s sad that there are people out there that just don’t care about copyright. Wow, what a crummy thing to happen! And you’re right – those retractions written by newspapers aren’t even noticed. I’m sure you’ll think twice about letting a newspaper use your photos again. I just hate that there’s an exploitation side of this: whether it’s a newspaper or a blog, people are using other people’s property to get more traffic, or to make themselves look better…or because they’re just lazy. Ugh. Such great info, Jeni. Thanks. As informative as is this article, I should point out that using the “thief blogger” who actually cited the link where she “stole” the said photo is a little unprofessional. You should have used an example created from your imagination rather than picking on someone because she “stole” one of your clients or friends. The professional thing to do would have been an anonymous example and end the disagreement when the photo was removed and sorrys where said. As other people saying “is the internet, get over it”, we need to understand not all people is literate as others are in the copyright and plagiarism areas, and about some other sarcastic or insulting comment, well you and Cathy decided to get in the internet, and with that comes people being not nice to others. You should move past that and take a more professional and ethical approach next time. Hello B, I appreciate the respectful tone of your comment. I’ve gone through this post and tried to make sure there are no “specifics” mentioned that would point to where this took place. In fact, the only people who will make a connection at all are the people who come over from the comments of that other blog…and I’ve let the blogger know she’s free to just delete those comments if she wants to. The tone of this post is exactly the same as in all the other posts I’ve written; people who are regulars of my blog are used to my matter-of-fact style of writing. As I mentioned in my comments on that other blog, I’ve definitely learned some things about how “best” to approach this situation – and I’ve tried to carry over some of those lessons in putting together this post. The #1 thing I’ve learned, though, is to let other bloggers handle their own issues. Cathy is like a grandmother to me, so I approached the matter differently than I would have otherwise. I hope that the result of this post is that (1) ALL bloggers will be more wary of surfing Google Images for their post photos, and (2) when people discover their photos on other people’s blogs, they’ll be able to consider all their options (and the tone in which they approach things) before deciding on how to proceed. Thanks for your input – I appreciate you. Jeni- This is a great post. There is never a justifiable reason to take a photo off another blog and re-post it on your own without permission. Bloggers spend hours photographing and editing their images. As more and more folks seek to make an income (even a small one) from their blogs, copyright issues are becoming even more critical. Taking a blogger’s photos could truly be taking hard-earned money out of their pockets! Not OK. Thanks for shining a light on this issue. Great Article! I haven’t had this happen (that I know of) but it’s good info just in case. I am trying to get better about remembering to add a watermark. Hopefully your workshop will give me some tips on making the process faster/easier. I have a hard time making it look consistent throughout my pics, when I’ve cropped them different sizes. Interesting point about the image quality too. I just always assumed I needed to choose the highest quality possible to make them look good, but I’m probably overdoing it! That is about the cleverest way of dealing with this issue I have ever heard! Good for you. For whatever reason, people don’t seem to think stealing images is “as bad” as stealing other people’s words. It’s still hard for me to believe some individuals think this is okay (even in public school, I was taught it was wrong – and illegal – every single year)…but when a company does it, it’s a whole other level of disgusting. Thanks so much for your comment! While there are no “specifics” in your article regarding the case in point, your name is attached to the blogger’s comment section. I easily followed the link here so obviously I can put 2 and 2 together and ended up here, reading the positive comments you chose to publish while knowing firsthand that you haven’t published those from readers who happen to disagree with your passive-aggressive approach to this whole mess. Apparently you have taken it upon yourself to play the surrogate role of internet police instead of letting WordPress.com take care of their own TOS violations. While your intentions may certainly be noble in your own mind, it’s my impression that you have used this situation to promote your blog and expound on your misplaced sense of self-importance. And no, I would not like to get updates from the Blog Maven. Hi “Sally Sunshine” (your email address, since you didn’t leave your real name) – I don’t make a habit of policing other people’s blogs. I was protecting my client’s intellectual property and giving the blogger who “borrowed” the photo the opportunity to remove it from her blog so it wouldn’t be reported to WordPress.com. In my mind, this issue was over the moment the blogger took down the stolen photo; it has been resolved to the satisfaction of all parties involved – and you’re not involved. I would hope you have better things to do with your time than restarting old battles that are clearly over. I certainly appreciated this article and, forgive me but, I am more than a little upset with the two negative comments. I don’t understand when low morals and ethics are at work. I think XY is really exceptionally convicted of her/his position since s/he decided to post anonymously. “Sally Sunshine” doesn’t sound so sunny to me. I can’t believe that s/he and “B” up there in these comments think that it’s okay to steal. Exodus 20 specifically says something about stealing — what was it? — oh, yeah, Thou Shalt Not. The thing about the Internet is that people who have ugly opinions can hide behind their anonymity. Leave a name next time. My blog is not live yet but you can be certain that I wouldn’t hide my opinion behind XYB. Hi. This is exceptionally great information. Thank you. I am curious about those bloggers who use a collection of different bloggers pictures for their own themed blog. Example I was looking for a certain subject and found very scattered ideas and blogs about it. I had to dig deap, and spend a lot of time searching. I was wondering if I could actually start a blog connecting others of the same content as well? Crediting them of course. Even if it is “allowed” and even ifor you received permission, is that frowned apon. I’d be worried that the original bloggers were saying yes to be kind, and maybe it’s in reality looked down upon? Thank you again. My sister and I were one of the first few engravers on Etsy. Not a blog obviously but similar situation happened to us. After we realized a little bit of success, a few shops later came in and not only stole and watermarked our photos as their own, but copy/pasted the content of our listings. I was angry and wanted to go on a rampage, but didn’t want to reveal my hand. Instead, I just really amped up the shop–offered new products, new designs, emphasized all the benefits of shopping with us and our sales continued to climb. I periodically checked in on the others that stole from us and we left them standing still. Our sales exploded. Some part of me wants to thank them for motivating me after I had become complacent. It really is infuriating though. I try to remember to watermark everything I can now. I think plagiarism is a mortal sin. Content stealing is like taking a bit of a persons very soul. I am however delighted to see my work (fully referenced) pop up regularly and all over the world. Recently someone took free crochet patterns from Squirrel Picnic and others and tried to sell them as their own on wordpress. The customers recognised whose work it was and alerted the appropriate people. We must be vigilant. Plagiarism shocks me. Also, my latest issue along the same lines is I had someone copy my post verbadim, literally, word-for-word FB post with an upcoming event I was sponsoring (including a personal comment about my experience) and post it on her page/link to her site. HUH?? After I nicely wrote her a private message she credited me and has since sent a bunch of people my way. I think a lot of people think if they see it on the internet they can just copy and paste away. Love the Blog Maven! Thanks for everything! I love stories like yours, Wendy – they prove that when given the right nudge, most people can be very gracious. Good for you! This may not be the right solution for everybody, but I now only have the watermarked featured image saved in WordPress on my wife’s blog. All the other images load dynamically from SmugMug. The advantages are three fold – the pictures load much faster, they save memory space on your domain server AND there is a mechanism for blocking “right-click copying” – instead the viewer ends up on my SmugMug account with the option of purchasing the picture either as a hard copy or in digital format. On the odd occasion where I have had to use someone else’s picture I will admit that I have given credit but not asked permission. Simon this is awesome! Thank you, I have a Smug Mug account! Stumbled across this post, as I just found out about the right click-option the photos on my blog. You can let Google search for your pic on the web, and within 5 minutes, doing this search for 3 of my posts, each with about 5-10 pics, I had six matching results on other people’s website. Unbelievable! I mean… yeah, some people say it’s a compliment; but I know my pics are not too bad, as photography is also my job. I’m a professional photographer and earn my living with my pics – at least with the ones I get paid for. I have no idea where I should even start to clean this mess up. Is there an easier way than doing this right-click thing for each of my pics on my blog? I know what I’ll be doing this weekend: sending out invoices and requests to remove my images… Soooo frustrating. So frustrating, Michaela. I don’t know of a shortcut, but I *do* know that as the money-maker in your business, that’s not a good priority for you. IF there’s any way you can hire a VA (or just a local teenager!) to do that for you, then YOU can focus on doing things that will make money. If you’re a leader, you’re going to have a target on your back…so find a way to not focus on the pennies rolling out the back door, but on the dollars coming in the front door. Cheering you on, brave business owner! Thanks for this clear and informative post! I’m writing in response to the comment about the “right click” on images, and coming at this question to share the experience of an image grabber. As an interior designer, I search for images all over the web, to illustrate design concepts, colours, layouts and products. I file these images away for my own reference, and I usually make note where I got hem so I can go back to that source. From time to time I may use them to illustrate a design concept or presenting product options to a client. I do NOT post them publicly! While the right-click (or Ctrl-click on the Mac) is fast and easy way to grab photos, I also use screen captures for images in videos etc. The point being: it seems impossible to protect an image that is posted online from being grabbed by others. The only fail-proof option, it seems to me, is to watermark…and even then it may be possible to crop the image to remove the watermark. As I do more work and post images of my work online, I’m sure I will use the tips from the various comments to protect and identify my work! I have been totally scared of plagiarism since I was in elementary school HA! I tend to be the ‘follow the rules’ type and the idea that I could forget to reference a quote in my essays and get thrown in jail, completely terrified me. Perhaps my fear was a bit overkill, but it has certainly given me a healthy adult fear in the blogging world! I literally triple check that I have linked to another blogger more than once when using their photo, and of course credit them as well. Even with properly citing, it still makes me nervous…so I make it a habit of producing my own content about 95% of the time 🙂 Thanks for sharing this experience, Jeni, as it can be a bit overwhelming doing this whole ‘blog thing’ plus finding the time to research our rights as bloggers. Thanks for keeping it simple and clear and giving us some awesome resources! Your post was sent to me by a colleague who blogs, she had a photo stolen, so passed this on. Thank you for THE most helpful, and reasonable post. Keeping calm is definitely the right way! Thank you for this. I am so amazed by the number of people who think it is ok to use someone else’s intellectual property without credit. My first approach is to try to assume they don’t know what they are doing is wrong. If it is on a website, I send the owner an email or comment on the post explaining that I don’t allow question asking them to comply with my syndication requirements and the link. Most comply, some apologize and comply, others just ignore. However, if the image is on Pinterest, I report the pin, fill out the form, and Pinterest removes it. As a food blogger taking the photograph is the most expensive and time consuming part or writing a post. It amazes me that people think it is ok to steal picture from the net. It’s not exactly difficult to link back and credit, and/or ask for permission in the first place for that matter. I’ve never had someone steal my work (from what I know!) but I have had emails saying can i feature your header image in my blog post as I would like to talk about it, or can i use your favicon in this award I’m nomination you for? I’m glad that people are nice enough to do that, and I’ve always said yes, as long as you credit it back to me. I’m trying to think of a good way to deal with one of my competitors who keeps copying the images I create. I’m in the humor industry. Typically I overlay jokes and things on free public domain images. My edits, however, are not public domain. When I search for my keyword in Google, guess what I see in the images search? My own images but linked to the thief’s website first. They also outrank me in Google because their website consists of amassing a ton of content and putting it there. If they take mine, I’m willing to be all of their content is stolen. I could spend hours tracking down people who have stolen my money saving chart. And then there are the people who make near exact copies of my chart, only they change a few numbers and add their own website in place of mine. It’s infuriating. Especially when people have the nerve to say “What’s the big deal? It’s just a page with numbers on it.” It probably doesn’t seem hard to come up with ideas like this when you’ve never tried it. This is such an informative post but how do you know if someone is using your photos if you do not stumble upon their website? Isn’t it possible for someone to take your stuff and you never be aware?